Spacious 2 BR Suite at Wyndham Nashville - Great location with Downtown Shuttle! Property 4: Spacious 2 BR Suite at Wyndham Nashville - Great location with Downtown Shuttle! Property 5: Kingsgate Resort 1 Bedroom Suite. Perfect Summer Vacation Location! Property 6: BRAND NEW REMODEL!! JUST LISTED! OCEAN VIEW! NEW OWNERS! BOOK NOW!! Property 7: Resort Managed 2 BR Suite, Downtown Shuttle, On Site Service + Great Deals. Property 8: 2 Bedroom Suite- Kingsgate Resort. Great Rates + Friendly Williamsburg Experts! Property 10: Palm Aire Resort - multiple pools, activites, and wonderful children's program! Property 11: Cozy condo facing slopes, great get away, sister condo next door. Property 13: Mystic Dunes. Loads of Family Fun: Pools, Mini Golf, Bikes, Kids Club+ More! Property 16: The Jungle Queen Riverboat awaits you! Property 18: Coveted Wyndham Governors Green. Indoor Pool, Elevators, All Updated Suites! Property 20: Spacious 2 BR - Access to amazing on site water park - endless fun for the kids! Property 21: Classic Natural Beauty: Furnished Comfort; Quality Facilities; Fully Equipped. Property 22: 2 BR @ Wyndham Ocean Walk sleeps 8! Lazy River, Water Slide, and poolside bar! Property 27: Take in the beautiful and distinctive wine country! Property 28: 2 BR Suite in National Harbor - convenient location to casino and Gaylord! Property 30: Wyndham National Harbor Resort~ 1B Deluxe~ Sleeps 4 ~ Resort Amenities! Property 31: Awesome summers and gorgeous winters! Property 32: Treat yourself staying at this romantic retreat! 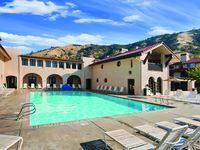 Property 34: 1 BR Deluxe at Coveted Glacier Canyon- Waterparks, Game Room, Pools, FUN! Property 35: Spring Break in Williamsburg - Convenient location to parks and Colonial area! Property 36: 3 BRs @ Bonnet Creek - Experts Since 2013. Best Rates + Tips for Your Stay! Property 37: Local Williamsburg Experts @ Tripbound - Vacation this summer in Williamsburg! Property 38: Wyndham Governor's Green-Close to Williamsburg Attractions, Updated Suites! Cottage 2 is great for family gatherings, & fishing on Lake Osakis! Property 39: Cottage 2 is great for family gatherings, & fishing on Lake Osakis! Property 40: 2 BR - Wyndham Ocean Boulevard. GUARANTEED OCEAN VIEW suite. Pools + Lazy River. Property 42: 2 bedroom 2 bath with full Kitchen and fireplace!!!!! Property 44: We're Experts @ Tripbound! Over 1,500 Bonnet Creek Reservations Since 2013! Property 45: Music lover? Your ship has landed! Property 46: You will keep coming back for more! Property 47: Welcome to Clear Lake! Property 48: Take in the beautiful and distinctive wine country! Miles of walking, hiking or biking trails! Property 49: Miles of walking, hiking or biking trails! Property 50: Love the outdoors?? ?